Perfect for a professional salon or home use. Ideal for professional and personal use alike. Client relaxation remains paramount with the soft cushioning of this couch. It is a three-section couch that is ideal where ease of body position is important. The perfect all-rounder suitable for all beauty therapy treatments independently manually controlled head, back-and-foot-rest, to shape the chair into whatever position is required, therefore can be used as a chair as well as a flat table for any form of massage on any size of person. It comes with face hole and plug, along with a flat-ended section to allow the therapist close access at the top-end. Contoured corners allow for ease-of-access, while the head rest can be positioned positive and negative (below the main couch level). Removable cushion with face hole. -The homcom brand stool’s height is fully adjustable and keeps the clients within reach while in a sitting position. 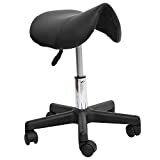 -This stool is also suitable for hair salons, beauty parlours, tattoo studios and many more. -The stool is comfortable, fashionable and practical. -5 smooth rolling casters wheels. -Easy to assemble, lightweight and easy to store. -Anti Slip wheels for safety purpose. -Slides effortlessly adjustable galvanized gas-lift. -5cm high density cushion – Comfortable while sitting for long periods. -With a set of screw accessories and a rocket screwdrivers. Extra thick padding (up to 9 cm) for convenient treatments. Headrest with removable padding for hygienic cleaning. Quickly and easily adjustable to different needs. Tilt, height, legs, neck, arms and buttocks. Perfect stability thanks to the robust metal frame. Headrest, adjustable with quick release. 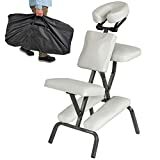 Massage chair can be folded up quickly for easy storage and transport. Metal frame with durable powder coating. Supports up to 200 kg.